Motorola employee, as General Digital, initially (and briefly) a manufacturer of MOS test equipment. It rapidly became a speciality semiconductor maker, with start-up capital provided by several individual investors and industrial giant Emerson Electric. Around July 1971, it adopted its current name and soon introduced its first product, the WD1402A UART. Compaq and Control Data Corporation's MPI division, now owned by Seagate Technology), starting in 1986. Throughout most of the 1980s, the family of controllers based on the WD1003 provided the bulk of WDC's revenues and profits, and for a time generated enormous corporate growth. Western Digital Caviar 80 MB (model number WDAC280-32), from a series of HDDs for desktop PCs; it is a 3.5-inch HDD mounted onto a 5.25-inch adapter bracket. 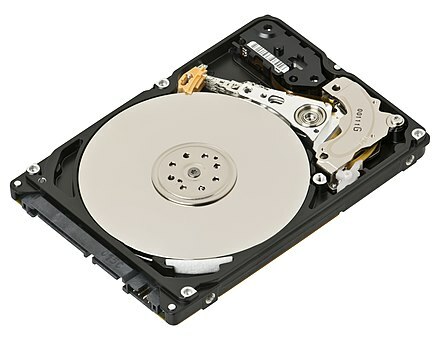 Western Digital announced the WD GP drive touting rotational speed "between 7200 and 5400 rpm", which, if potentially misleading, is technically correct; the drive spins at 5405 rpm, and the Green Power spin speed is not variable. WD GP drives are programmed to unload the heads whenever idle for a very short period of time. Many Linux installations write to the file system a few times a minute in the background. As a result, there may be 100 or more load cycles per hour, and the 300,000 load cycles rating of a WD GP drive may be exceeded in less than a year. Dell spokesperson also stated they were "working with our hard drive suppliers to address potential impact for the remainder of the year." Despite this, Western Digital's profits increased following the increase of HDD prices. Green drives were energy efficient, with slightly slower performance; they have been discontinued. Blue drives are average performance. Black drives are high performance. Red drives are designed for NAS use. Purple drives are designed for surveillance data storage. Gold drives are designed for "datacenter" use. Western Digital hard drives, partitioning and formatting hard disks, copying files between disk partitions, displaying numbers, size and type of partitions, displaying basic technical disk information, such as firmware revision, S.M.A.R.T Support (Enabled/Disabled), ATA # supported, R/W Multiple, PIO Mode Support, IORDY Support (Yes/No), Sectors/Block, PIO Cycle Time. Western Digital settles drive size lawsuit, arstechnica.com ^ NOTICE OF CLASS ACTION AND PROPOSED SETTLEMENT (“NOTICE”), wdc.com ^ "Some Popular 'Self Encrypting' Hard Drives Have Really Bad Encryption". Motherboard. Retrieved May 15, 2017. Wikimedia Commons has media related to Western Digital.